In full disclosure, the original focus of this column was my personal battle with sciatica, but my wife encouraged me to swallow my professional pride and include the accompanying health-club incident as well. Thankfully, I’ve experienced very little pain from the knee instability I created, primarily due to a rigorous rehab routine, which includes swimming six days a week. Earlier this year, however, an orthopedic buddy got me going in a different direction when he brought over a new 3D laser-designed custom knee that was guaranteed to get me back hiking the hills of our Costa Rican casa. That was all the encouragement I needed. 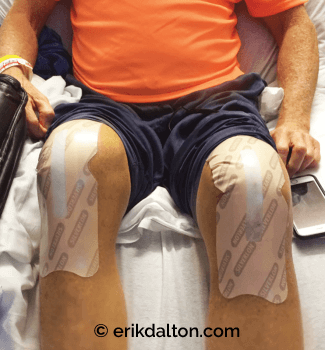 A successful bilateral knee replacement surgery allowed me to walk unassisted through the neighborhood by week three, but an unexpected and unfortunate event transpired during my initial hospital stay. As I was lying awkwardly propped up in bed one morning, excruciating pain began shooting down both hips into my legs (Image 1). I’d never personally experienced these symptoms before, but the verdict was immediately irrefutable: bilateral sciatica. In the Treatise of Diseases, Hippocrates coined the term “sciatica” from the Greek ischios, meaning hip. For decades, pelvic and leg pain were wrongly attributed to a subluxated hip. Unfortunately, many of us still consider sciatica a disorder when, in fact, it is a set of symptoms resulting from nerve compression and inflammation. Although there are numerous causes of sciatica, the most common include lumbar disc herniations, osteoarthritic facet joints, spinal stenosis, piriformis syndrome, spondylolisthesis, and sacroiliac dysfunction. In clinical practice, I am not a proponent of disease labeling and find that pep-talking clients does more to improve therapeutic outcomes than focusing on a perceived pathology. For example, discussing X-ray findings such as a herniated disc often plants dramatic negative images (the nocebo effect) that may cause the client unintended psychogenic harm. However, in this therapist-oriented article, I feel compelled to include a “fly-by” on sciatic pathology and symptomatology to demonstrate how I was able to reduce neural inflammation and sciatic entrapment pain caused by an L4–L5 central disc protrusion. A 2016 Journal of Neurosurgery study suggests a good prognosis for those of us suffering our first bout of sciatica.1 In fact, the study’s authors found that 60–80 percent of sciatica sufferers report a spontaneous resolution of the leg pain in six to eight weeks, but there is a catch: the odds of this spontaneous pain relief depend on the type of disc problem that caused the pain in the first place (Image 2). The researchers discovered spontaneous regression in 96 percent of subjects with disc sequestration, 70 percent with disc extrusion, and 41 percent with disc protrusion. 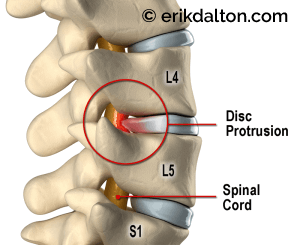 The disc protrusion illustrated in Image 3 is the exact type that has plagued me the past eight weeks. Notice that the distended disc nucleus is still encapsulated, but it’s shoving the annular fibers against the spinal cord. Surprisingly, my MRI was completely clean other than this innocent-looking little disc bulge. routine to flush inflammatory agents. The medical community’s opinion about the puzzling onset and severity of my symptoms is that the impaired disc had probably been asymptomatically dormant and was triggered by awkward hospital-bed positioning. The downside to this type of disc protrusion is that, left untreated, statistically only 41 percent of people with this disc problem heal themselves. The upside is that I was a bit smarter with the low-back situation than I was with my knees. Resolution of the unrelenting pain came from a combination of myoskeletal bodywork… to align, decompress, and flush inflammatory agents from the lumbar spine (Image 4) – and corrective nerve-mobilization exercises, designed to release entrapments along the entire length of the sciatic nerve (Image 5). As my sciatica improved, the burning, stabbing, and muscle spasticity slowly began to leave my legs and move to the low back. Image 5: Sciatic nerve mobilization techniques (stretch and floss) helped improve my sciatica. 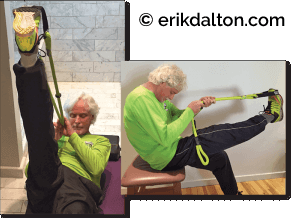 This is a common sign of sciatic healing, which was further enhanced by the addition of a variety of playful exercises, meditation, and improved nutrition. 1. A. El Barzouhi et al., “Prognostic Value of Magnetic Resonance Imaging Findings in Patients with Sciatica,” Journal of Neurosurgery: Spine 24, no. 6 (June 2016): 978–85.